SKU: EclipseEtha Categories: Planet Eclipse, Specials Brands: Planet Eclipse. Quality – The Etha uses the same materials machined to the same tolerances as those found in other Eclipse markers such as Ego, Geo and the Etek. In many cases, such as the regulator internals, they are the exact same parts as those used in those other markers. 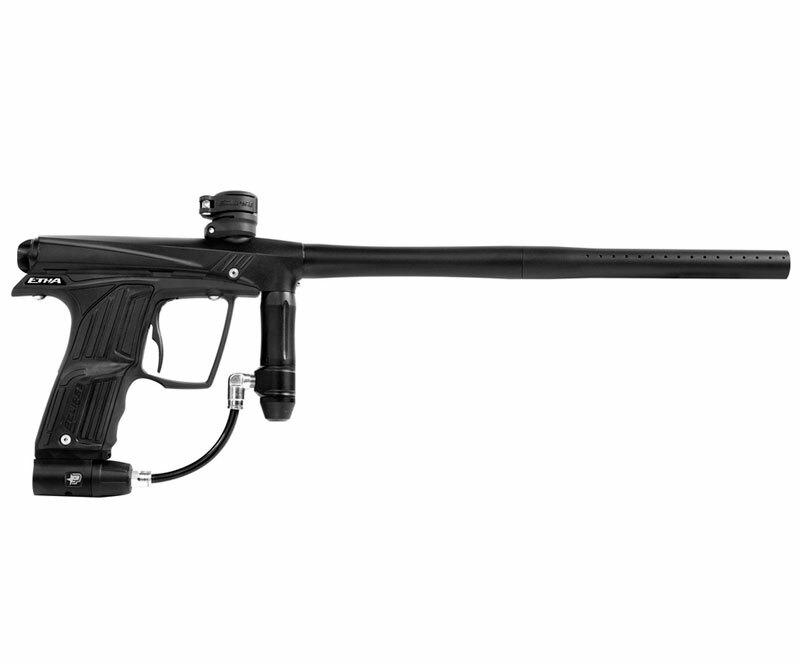 The philosophy behind the Etha is to reduce costs by simplifying the design of both the internal and external components, and manufacture those components to the same level of accuracy and quality as those found in other Eclipse markers and not to reduce cost by using cheaper materials machined to lower tolerance on less accurate machines. Of course quality doesn’t stop with the parts that go into the Etha. At every stage of production and assembly the same systems and procedures that are used to test components, sub-assemblies and fully finished units during the manufacture of all other Eclipse markers, are utilized on the Etha production line. During assembly each marker is given its own unique barcode which stays with the marker on its journey through the factory. Once assembled, every Etha is repeatedly tested for leaks on state-of-the-art leak detection equipment before making their way to the testing room. Once in the testing room an Etha has its barcode scanned to initiate a comprehensive computerized test procedure and then has paintballs fired through it on a range and over a chronograph and the velocities noted. All tests are recorded alongside the markers serial number and barcode in our production database enabling us to track each individual marker and results can be accessed at any time in the future. Only once an Etha has passed all tests is it given its final Passed Test tag and moved to be packaged. Though long and laborious, the testing of every single marker by this method means we can be fully confident that when a customer opens up that case for the first time that the marker should work flawlessly, achieving full velocity and completely leak free. Reliability – Utilizing the philosophy mentioned above, regarding the quality of the manufacturing of the components that go into an Etha, helps us immeasurably in building-in our second goal – reliability. Using proven materials, manufactured using proven methods and finished with proven techniques that we have used for years in the manufacture of our other markers means that we have an incredibly strong platform on which to build. Quality materials, machining and finishing are only part of the equation. The design has to be robust enough to work in all conditions, all of the time, shooting all kinds of paint. From arid desert to frozen wasteland every Eclipse marker is expected to work, without excuse. It should work when you take it from the box the very first time it comes out of the packaging and it should remain that way for as long as possible with just the bare minimum of regular maintenance. In order to prove the reliability of the design the Etha has undergone intensive field testing. Hundreds of thousands of paintballs have been shot through it during development and testing in order to uncover any flaws or defects in the design before being put into production. This is a critical part of a new products development and years of manufacturing markers has shown us time and again that there is just no substitute for getting markers into the hands of players and shooting paint through those markers, lots of paint! Only after months of brutal all-weather testing will the final design get signed off and earmarked for production. But that’s not the end of testing. Moving from prototyping to production creates its own series of challenges. So once a new product is put into production the first batch of markers are pulled from the production line and split between intensive longevity bench testing and a select group of players and teams across the world to carry out final approval. Only after satisfactory feedback from all these different sources will a new design be considered fit to go into full production. At this stage we are confident that we have a marker that will live up to the Eclipse legacy of reliability. Service – Eclipse has always been about a lot more than just what you get in the box. There are the things you can’t really put a price or a value on, such as customer service and support. Eclipse prides itself in having one of the most comprehensive technical support and dealer-backed networks in the industry and that network is there to support you whether you shoot an Ego CSL or an Etha. We invest heavily every year in making sure that the stores and dealers that sell our equipment know how it works and how to fix it and have access to all the spares and accessories needed to maintain and repair our products. These trained technicians can be found in stores all across the globe. We endeavor to have technicians at more events, more tournament series and more big games and scenario events than any other manufacturer out there. We try to make sure that we are available to help our customers when and where they need us: at events. We understand that players invest a lot time, effort and money in order to attend these events. So we try to ensure that, if the need arises, for whatever reason, we’ve got your back and are there to get you out onto the field having fun and winning games. Support and customer service shouldn’t only be the preserve of those that play major events. That is why Factory Trained Planet Technicians are never more than a phone call or an email away. Every attempt is made to answer enquiries and queries in the most timely way possible so that any downtime is kept to an absolute minimum and your equipment is always running at its most optimal. For when you simply cannot get hold of someone when you need them, there is always the hugely comprehensive printed manual, tool kit and spare parts bag to help tide you over. Hopefully there is little else you should ever need. 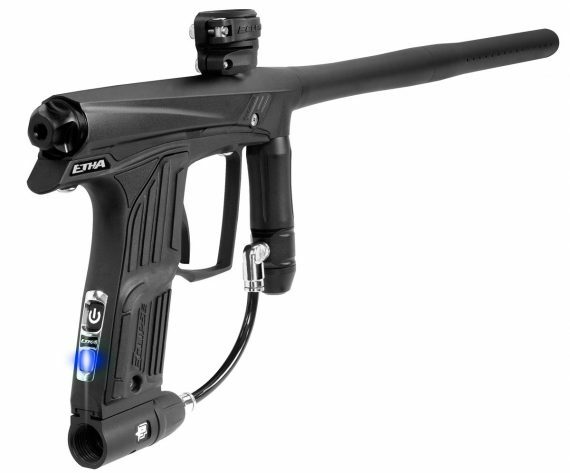 Inside Etha – But what of the Etha itself? Well, internally the Etha is a radical departure from anything seen before in an Eclipse marker. For the first time we utilize a spring return bolt system in the firing mechanism, allowing us to simplify the pneumatic side of the marker and use a Pull Poppet spool to release air from the firing chamber. The Etha bolt features dual-stage acceleration so that it picks up the paintball at a lower speed before accelerating further to push the ball fully into the barrel. The front of the bolt has a ramped rubber section. This extended rubber piece is both removable and replaceable and designed to flex freely in order to prevent clipping of the second ball in the stack as well as to be flexible on the face to cushion the paintball as its pushed toward the barrel. Both of these features work hand-in-hand with the Deftek Feed System and Break Beam Sensor System to keep any occurrences of barrel breaks to an absolute minimum. The Pull Poppet that releases the air from the firing chamber is driven by a new, super-robust high pressure solenoid that is controlled by the fully adjustable PCB. The PCB controls the firing mode (semi-automatic and ramping), rate of fire, dwell and de-bounce through the multi-colour LED mounted in the rear of the frame. It is pre-programmed with modes compatible with all major tournament series meaning no upgrade needed wherever you play. The frame, together with the lever operated clamping feed-tube, eye covers and the new OOPS knob are all manufactured from extremely resilient glass reinforced nylon. The Etek3 LT has proven to us just what this amazing composite is capable of: it is extremely strong, very tough, and more than capable of handling the abuse that even the roughest and toughest paintballer can throw at it. When it came time to specify the materials for Etha there was no question that this material would be at the top of our list for these parts. Inside the frame there are sintered brass bushings for the trigger pin to pivot on and a captured, fully adjustable leaf spring similar to that found in the Ego11. These components combine with the externally adjustable trigger to produce a crisp, smooth trigger action with which to operate the micro switch. And for the first time in an Eclipse marker the trigger can be fully removed for maintenance or cleaning without having to separate the frame from the body – it makes cleaning up after a hit to the frame a breeze. To help keep paint and debris out of the inside of the frame, the grip panels are sunk into the frame around their perimeter, they also use a clever upper locating tab that means that each grip panel only requires one screw to fix it in place making access to the board and battery quick and easy. On the bottom of the frame there is a brand new OOPS (On/Off Purge System) ASA with front exit porting and the same internals that are found in the POPS ASA. It actuates with the twist of a knob and fully vents the entire marker when turned off. It mounts to the frame via the robust T-Slot system. The OOPS feeds through a macro-line and up to an SL3 regulator. The SL3 reg was first seen on the SLS and has since made its way onto the Geo2 and the Ego11 as well as the CSL where it has been very well received. With the ability to run HP, MP or LP compressed air tanks without adjustment it makes it a truly versatile regulator. And with its replaceable and reversible main seal it is robust, reliable and easy to service too. Like all other Eclipse markers, the Etha is designed to run solely on compressed air and not CO2. The barrel also shares some similarities with those found on its bigger brothers. The Etha barrel is a 14.5 inch, two-piece, precision honed, 0.693 bore barrel that has a Cocker thread into the gun body and uses the same threading as the Shaft4 barrel to join the front section to rear section. This means it has the longer control bore as well as being compatible with all other Shaft4 barrel accessories such as the Boost Kit and 16 in tip. With such a good standard barrel there should be no reason to run out and spend money on an aftermarket system. And like all other Eclipse markers, the Etha comes delivered in a hard case, lined with shock absorbing foam and packed with everything you need to look after and maintain it: a full color manual; a full set of hex keys; a tube of Eclipse Grease; a comprehensive marker and regulator spares kit; and a barrel safety device. The Future – So that is what goes into the Etha today. What about tomorrow? With paintball moving into ever expanding markets it makes sense to make provision for future developments. The Etha has been designed and constructed with a modular approach in mind and incorporates mounting points around the body for the addition of accessories and upgrades to be bolted directly to the marker. It should make for economical expansion of the Etha for those looking to build upon this exciting new platform.